The side table is made from recycled materials and is used as a nightstand. 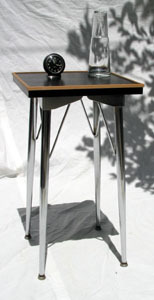 The chrome steel legs are salvaged from cafeteria tables. The top comes from the top of a discarded desk which was cut to size then ebonized and trimmed with strips of scrap maple.